One of the lovely things about creating bespoke cocktail for people are the little glimpses you get of peoples' lives. Poppy and Chris, the recipients of the Love Sonnet cocktail, were kind enough to give their consent to let me share the details of it with you. In order to come up with something meaningful and appropriate, you must first get a measure of who they are and in the case of this lovely pair of newlyweds, it was a delightful back story of a couple with a real love for the theatre, who met later in life and were now getting married. 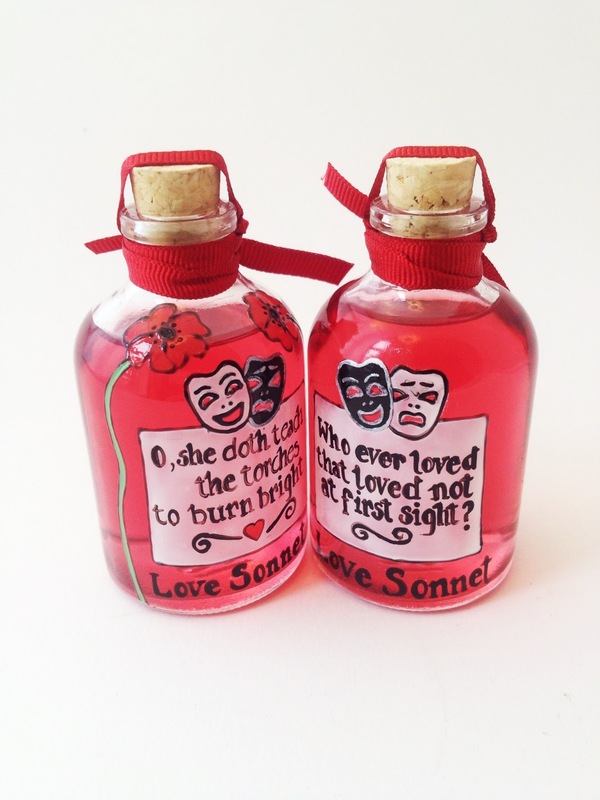 Their wedding was to have a theatrical theme with plenty of Shakespearean references and the bespoke cocktail was being created as lovely wedding gift from a friend. I wanted to create something that was both a celebration of love and romance and that acknowledged their love of Shakespeare and drama. The colour red symbolises love, is full of drama and is also the colour of poppies, which tied in nicely with the bride's name. 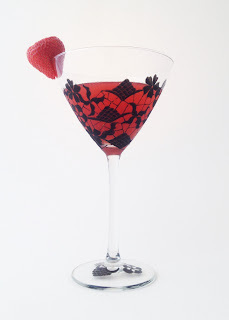 The red in the bottle comes from a dash of Creme de Cassis, but the deep red colour in the finished cocktail is from fresh strawberries which also have romantic connotations. The cocktail was to have a floral note and for this I used a little Chase Elderflower liqueur which marries well with fruit and a dash of rosewater. The rose is to signify romance and doesn't overpower the drink, just adding a little complexity to the elderflower and complimenting the hint of rose infusion in the Hendricks gin. 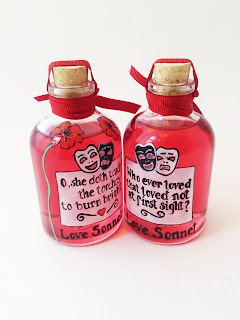 The miniature bottles are painted with Shakespearean quotes about love and the masks of tragedy and comedy, which were part of their wedding's theme. Poppy's bottle was also painted with two little poppies to differentiate it from the groom's. 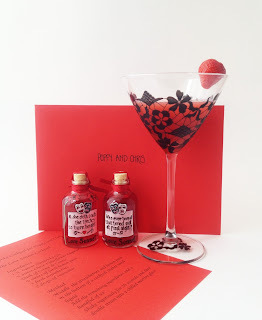 The bottles, which contain the alcoholic part of the cocktail were accompanied by a recipe and handwritten explanatory letter, telling them why I had chosen the ingredients and painted the bottles with those designs. If you are thinking of ordering a bespoke cocktail, either for yourself, your company or as a gift, then please take a look at these links for examples and more information.